A small but select group of Mountainviews met for a walk in Newcastle Co Down last Saturday 6th April. The low clouds that were covering Slieve Donard at 9.30am lifted by 10am to give us a wonderful sunny day with amazing views. 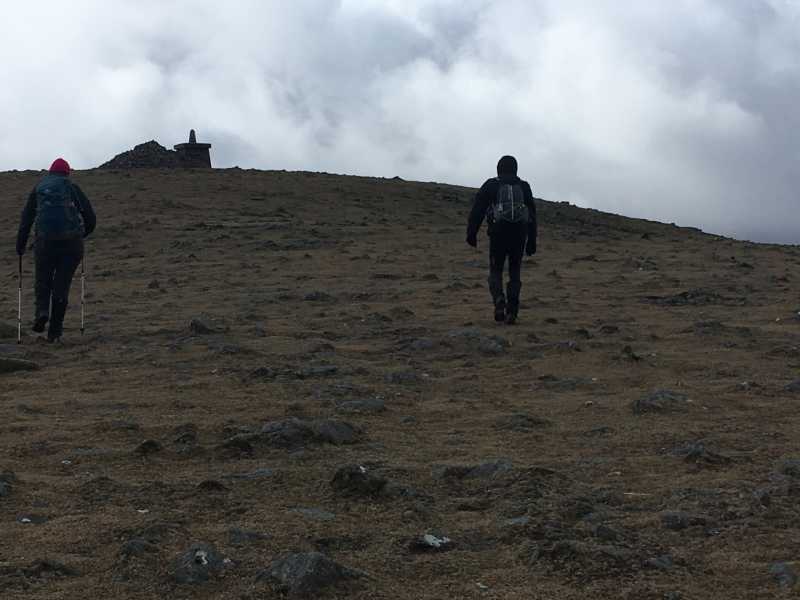 Having done most of the hard work with an ascent over Thomas's mountain to Slieve Donard we decided to extend the original planned walk to make the most of the perfect conditions. Following the wall from the summit towards the Bog of Donard we followed the Brandy Pad around the base of Commedagh before ascending to Slieve Corragh and on to Slieve Commedagh. Returning to Newcastle along the shoulder of Commedagh looking down to the Glen River. Well earned refreshments were enjoyed in McHugh's bar and restaurant following the walk. It was a most enjoyable way to spend a Saturday. The jaw dropping view from Middagsfjall Ridge overlooking Funningsfjørður and the rugged and mountainous interior of the island of Eysturoy in the Faroe Islands. On the far left rise the mountains on the islands of Kalsoy and Kunoy. The centre is dominated by the spiky Sandfelli (Oyndarfjørður) Massif rising to 754 metres, and on the far right rises the pyramid-shaped Húsafjall (695 metres). We climbed this steep ridge in the twilight to get this view over Funningsfjørður at dawn. The mountains had received a dusting of snow overnight, and the temperature was round freezing, with a fierce wind giving a wind-chill of about -10 °C. Although the dawn was somewhat muted, we were delighted with this image, created from three horizontal wide angle shots. MV Winter Talk in Dublin next Monday! A date for your diaries! 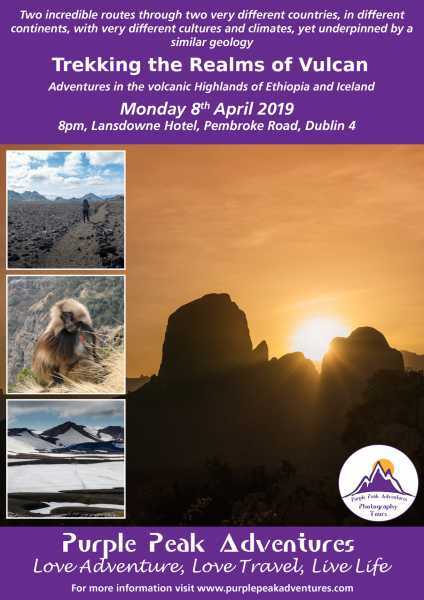 Martin and I are delighted to be supporting the MV winter talks series, and we look forward to coming over from deepest Donegal to give a talk on trekking the geological wonderlands of Ethiopia and Iceland. Please help spread the word for a good turnout. Looking forward to seeing you in Dublin Monday 8th April at the Lansdowne Hotel. The current value for the Galway area is -3.91, increasing a degree every 3 or 4 years. So I have redone the route cards for the Maamturks and you will find that now on the website. While not a MountainViews matter, I am glad you have raised it since accuracy is important. As always there could be an error in the implementation of this - let me know. 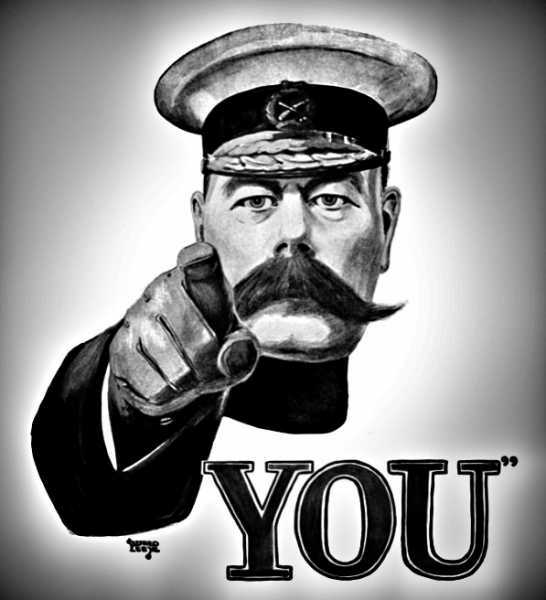 Let's hope your chest infection improves! Mountainviews walk in the Mournes. Saturday 6th April 2019. Slieve Donard starting in Newcastle, the route will be up to Thomas's Mountain and on to Donard. Following a descent to the Col with Slieve Commedagh then up to the summit of Commedagh and return along Shan Slieve and Slievenamaddy. A total of 11kms, 1,000m of ascent taking 5-6 hours. Sitting here with a chest infection that I hope will clear in time for the Maamturks Challenge on Saturday week, and trying to do some 'desk practice' to refresh my navigation skills. And trying to figure out how to take accurate bearings, adjusting from magnetic to grid north, when navigating from the route card rather than the map. I note that this route card says it was last revised in 2006, so when I'm out doing the walk, do I simply pretend I have time travelled back to 2006, and work out what the variation would have been that year? My Harvey Superwalker map of the area says Magnetic North is 5 degrees west of grid north in 2010 and decreasing by 1 degree in six years. So, by my rough calculation, in 2006 magnetic north would have been approx 5 degrees 40 minutes west of grid north. So I'll need to add that to the bearings from the route card to get grid north today. Am I right or have I lost the plot completely?! It's important to support the mountainviews website. Your website. It supports you, with everything you need to know about hills and hill matters throughout the country. The biggest source of mountain info in Ireland. So you need to support it. 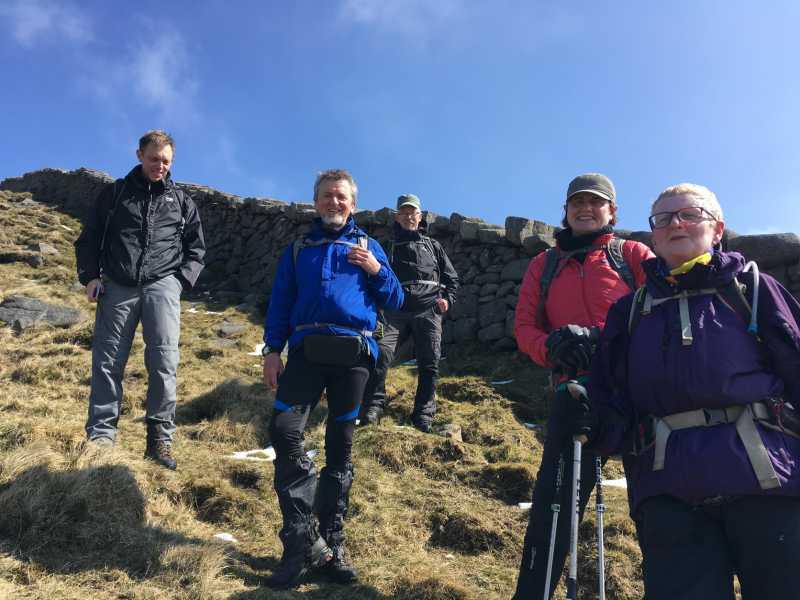 Liz Ashton, committee member of mountainviews, entirely at the cost of her own time and effort has put together a walk for you Saturday 6th April. 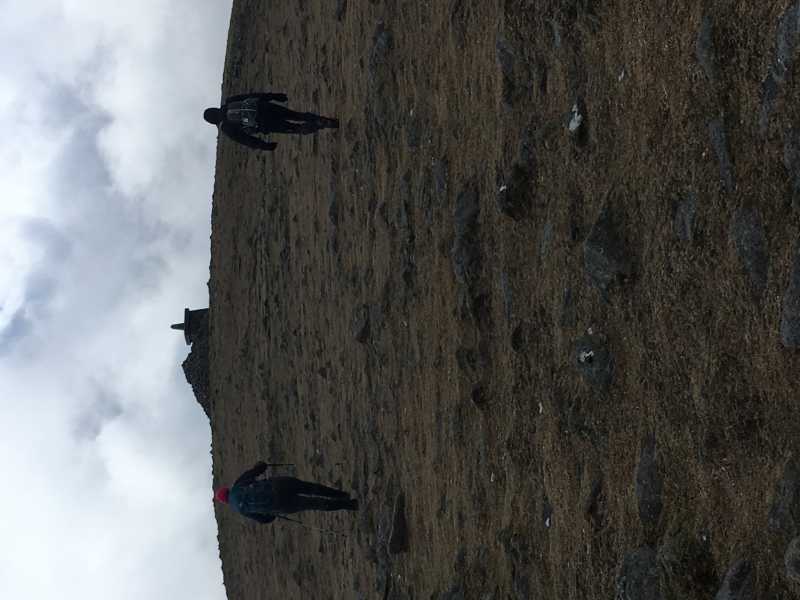 This entailed her choosing a locus, planning a route and variations, recce-ing the walk, researching and sourcing apres walk facilities, advertising the walk and more. .... and the hardest thing of all was to get me out of my armchair and go plotting mountains with her. So support this walk on Saturday. It's not a big ask and given a fair wind might be one of your best walks ever. 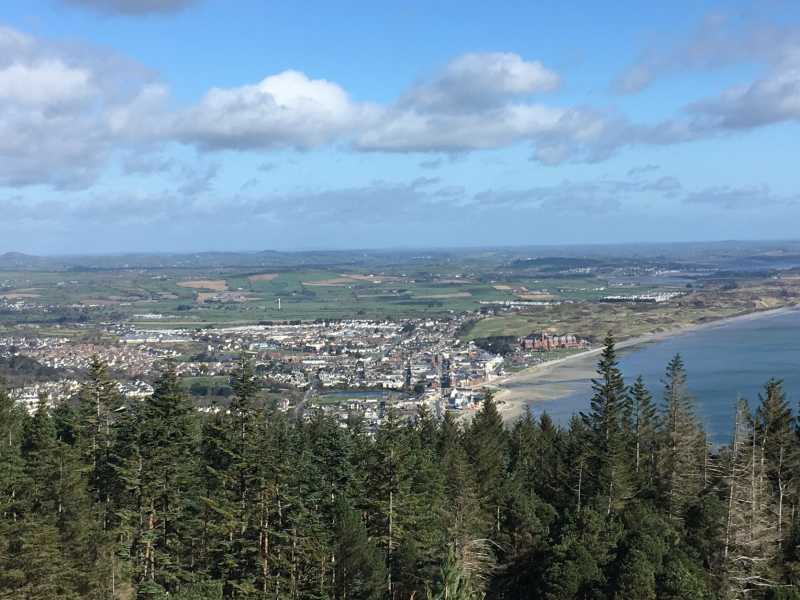 It's a comfortable B grade walk in the beautiful Mourne Mountains based in Newcastle Co Down and plans to take in Slieves Donard and Commedagh. With the likely postponement of Brexit until June at the earliest a Green Card will not be required to attend the Mountainviews members and friends meetup walk in the Mournes on Saturday 6th April 2019!.